The coup in Turkey has failed overnight despite a section of the military taking control of Ankara and Istanbul. 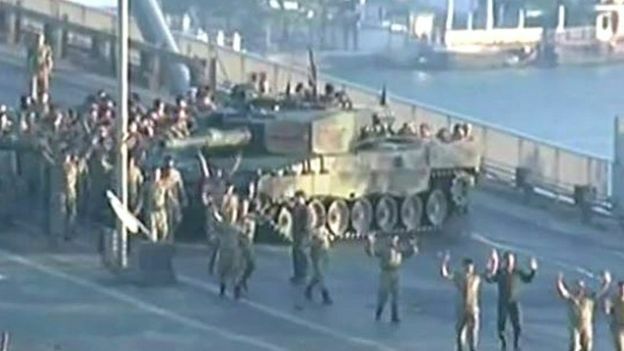 Troops controlling the bridges across the Bosphorus in Istanbul surrendered and President Erdogan flew into the city to appear on TV. The coup leaders underestimated the support for Erdogan who used an independent TV station to call for his supporters to take to the streets and defy the curfew. Thousands of people climbed on tanks and faced down troops, undermining the authority of the troops. For now at least Erdogan is back in control but it remains to be seen how long the military top brass will stand by while he eats away at Turkey's secular state.